Conceptually, this 7th CMP video is the most disgusting. 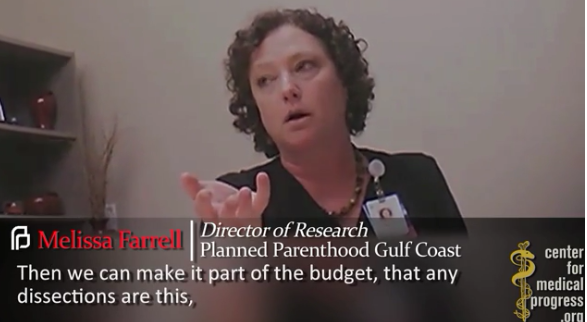 One of the examples given by Holly O’Donnell a former Planned Parenthood technician is how they “harvested” an intact brain from a late-term male fetus whose heart was still beating after the abortion. I wonder how it felt to the living child, I pray I never find out. With its practice of cheapening the perception of life in order to push abortions and mutilate the dead fetus (or in this case live baby), Planned Parenthood is not only destroying the soul and life of the aborted baby, but also a bit of the soul of the mother who they confounded with their twisted logic. And as the ancient Rabbis implied, each time Planned Parenthood successfully convinces a woman it is just recycling, the disposal of the “products of conception,” they are destroying part of the soul which gives us our humanity and, thus, the entire world.